UBUNTU = "Because we are, I am." Pre-registration is required. You will receive the specific address and other important details when you register. If you cannot afford the regular registration fee, ﻿email us﻿ - no one will be turned away for lack of funds. 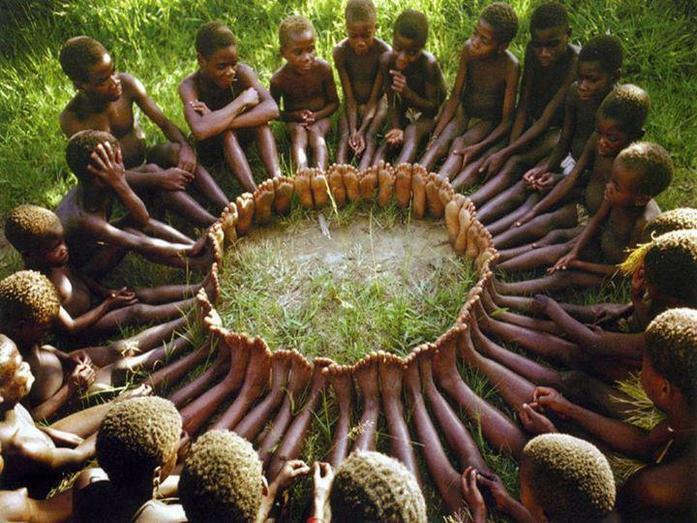 - Learn and practice the Zulu concept of ubuntu, "Because we are, I am." - Exciting updates on the AMERICAN UBUNTU film project! We welcome you to bring your checkbook or card of choice! What Is A Conjure Dance? NOTE: These notes shall only be used, distributed or reproduced with the written permission of the author, Robert F. Bailey. The Conjure Dance is a dance ritual and ceremony with origins in New Orleans. It arose from the melting pot of many cultures and spiritual practices that had gathered in the deep south during the 1700’s. These cultures included: Native American, African, Creole, Cajun, French, Spanish and Caribbean. During this time in history, the city of New Orleans and the surrounding areas comprised an incredibly cosmopolitan world. In this world there were ample opportunities for the exchange of ideas, knowledge, cuisine, fashion as well as spiritual practices. This interface and exchange provided fertile ground for the emergence of new and unique spiritual practices and ways to work effectively with the Helping Spirits. Many of these cultures already had strong traditions which influenced this new world and contributed greatly to what emerged next. One common practice woven throughout these cultures was dance. Dance was not only a social activity, it also provided a way to directly access the realms of the Helping Spirits who were regularly invoked to resolve problems, cure illness, alleviate suffering and restore justice. People would gather regularly in community to commune with the spirits. One place the people would gather in New Orleans was “Congo Square”. During the spiritual dances held in Congo Square the drummers would beat improvised rhythms that would allow the dancers to transcend their ordinary state of consciousness and access spiritual states of consciousness. While in these spiritual states of consciousness they would merge with the Helping Spirits. Often times the presence and merging of the Helping Spirits would bring blessings to the entire community. On a larger scale it was the melding of these many traditions and the dances that gave birth to a unique form of working with the Helping Spirits that was effectively used to address major shifts in community consciousness and healing. Out of the drumming, dancing, acknowledgment and willingness to work with the Helping Spirits also came the incredible rich and uniquely American musical traditions of what we now call jazz. Although the exact origins of the Conjure Dance are not known, it proved to be a pivotal way of working effectively with the Helping Spirits as a means of returning balance and equality to a society whose sense of human dignity, compassion and equality was out of balance when the ravages and cruelties of slavery engulfed a fledgling nation culminating in a Civil War. In order to bring an end to slavery in the United States, the traditional spiritual practitioners of New Orleans jointly focused their efforts through the Conjure Dance with the intention to end slavery. They literally danced a new reality into existence using the Conjure Dance. Ultimately they prevailed and slavery was abolished. Many cultures throughout the world continue to access altered states of consciousness and the spiritual realms through dance. The Conjure Dance remains a powerful ceremony of effective transformation and has emerged to help us once again work with the Helping Spirits to dance a new reality into existence. The tradition of the Conjure Dance continues today finding its way from the hot steamy city of New Orleans, to the Bay Area [and beyond]. It is an incredibly powerful, energizing, uplifting, and serious ritual. And, it is a beautiful way to come together as community, something that many of are drawn to in these times of global transition. The world is changing and it is time to conjure the new world in which we and our descendants will live. The Conjure Dance is set to percussive music. There is an invocation of powerful compassionate spirits to engage their help for a specific healing intention on behalf of the community. Everyone dances for this intention. As we dance, the spirits become embodied for the purpose of assisting with our request for healing and transformation.